We offer a variety of pricing options to suit all of your VDR needs. 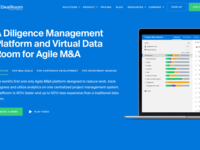 A diligence management platform and virtual data room for Agile M&A. 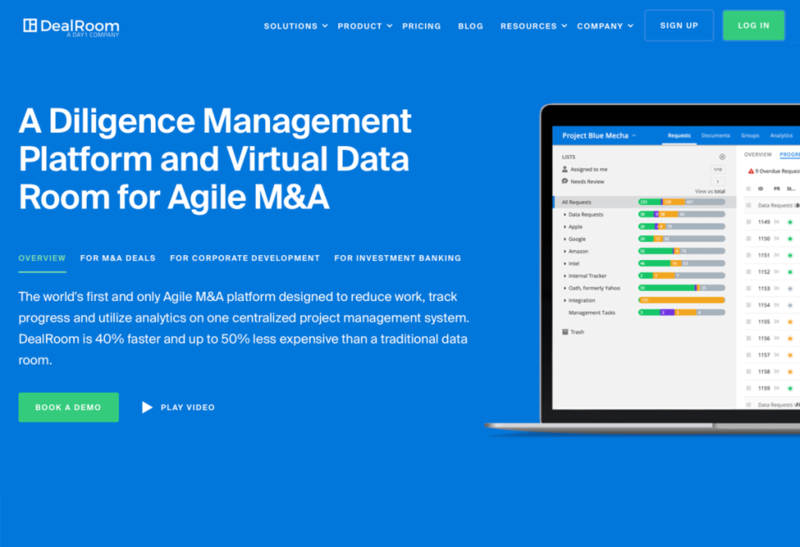 The world's first and only Agile M&A platform designed to reduce work, track progress and utilize analytics on one centralized project management system. DealRoom is 40% faster and up to 50% less expensive than a traditional data room. Pros: I love task tracking feature that is unique to the DealRoom software and the fact that you can control permissions down to the individual file level, but what I like the most about this software is the customer suppport. The CEO personally reads and sometimes responds to customer inquiries and requests for features. Additionally, the customer support team is extremely responsive and works to resolve your issue within 24 to 48 hours. Cons: There are certain features that I would like to see in the group permissions management section, but I have been told the team is already working on it and the new feature should be out in 1-2 weeks! Pros: Dealroom is easy to use, you can populate dealroom with your due diligence folders and create due diligence list right inside the dealroom instead of sending the due diligence list separately to your clients. Cons: Missing Outlook plugin which is mostly available will update tab that would allow execution team to update status on this would allow execution team to update status on transactions. Overall: It helps us manage the document / info sharing between the client, our firm and the potential investors. It also allows us to manage users, their permissions etc. It is also helping us managing the analytics on user access. It is easier to upload large size files and share it with intended users which is not possible on outlook due to size limits. Cons: Absence of Microsoft outlook plugin as well as inability to update/track deal marketing progress so you can categorize deals in terms of their status. Pros: This software has stood out to me for various reasons. Cons: - It doesn't seem clear to me as to how to attach data room document numbers to the top of the document when downloaded from the site. Overall: Thoroughly impressed, prefer it over competing products such as intralinks, MerrillDatasite One and even Ansarada. The download and processing speed of the site really stands out to me. Pros: I have experience with a few different Virtual Data Room platforms: Merrill DataSite, Donnelly, etc. Most platforms focus only on privacy and functionality at the expense of general user interface. I found Deal Room to be incredibly easy to use, despite having never used it before. This ease of use was greatly augmented by my experience with my customer success manager, who I will describe below. Cons: There was very little not to like. The software did exactly what I needed it to. Overall: The best part about using DealRoom by far was my experience with the customer representative, my customer success manager throughout the process. She chatted with me while in the portal, offering tips to ensure I took the best advantage of Deal Room's features. Even after I left the portal, she continued to follow up, doing everything within her power to guarantee I had a 10/10 experience. No other VDR platform I've used has even offered that type of personal support. And on top of that, she was one of the strongest, most courteous, and most helpful customer success manager's I have encountered in any product or service I have ever used! Pros: I like the functionality of the software. There are some very helpful features and the software is very user friendly. Cons: I would like the option to have multiple admins. I would like to be able to customize the software a little bit more. Pros: I liked that the workflow through the tool centered around what is most important in M&A transactions - getting things done. With the focus around Requests, DealRoom allows you to easily understand what needs to get done and who is responsible for outstanding items. 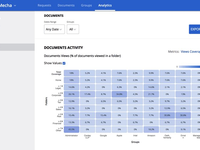 The platform is simple and doesn't try to over-complicate the workflow for M&A pipeline management. Cons: The focus on agile M&A can be a double-edged sword - while it helps get things done more quickly and introduces flexibility into your process, it isn't always what traditional M&A personnel are used to dealing with. For example, with the "Requests" approach not being named "transactions" or "playbook tasks" there can be some hesitation from the old-guard to adopt such a tool. Pros: Very easy to use and do admin of your various groups using the data room. 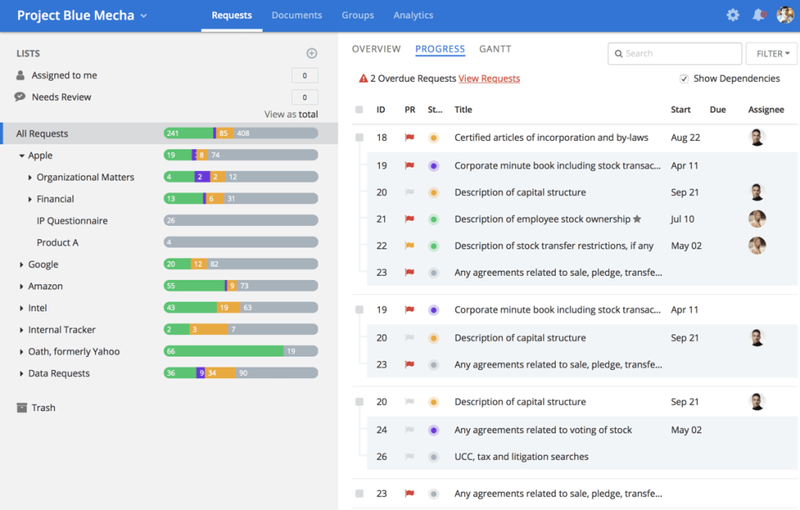 I really liked their request tracking feature and the project management capabilities to get all of the due diligence requests completed on time. The support team was fantastic to work with and always answer our questions on a timely basis. Cons: Nothing meaningful I can add here as I pretty much liked just about everything I got with this software. Pros: Easy to access user interface, speed is never an issue. The ability to track specific requests on an individual basis is valuable. Pros: One of the most enticing points of the DealRoom software is the fee structure. Not having to worry about page count is a relief. Cons: Although almost everyone downloads the files to view, the document viewer could be enhanced. Pros: We love the ease of use for our due diligence process. This platform allows a streamlined process to request and receive documents. Cons: We wish that there were office plugins so that files can be saved directly within dealroom and easing up our overall use. Pros: I like the feature that allowed me to see the latest uploads to the Dataroom. Cons: Sometimes there were difficulties in downloading the full data room to my desktop at once. Cons: We wish this platform had more analytical features, and allowed for outlook integration as well as a desktop version that can be installed to our computers in office for quicker access. Pros: I love the clean look and the various views for the deal documents. The search functions were extremely useful when they worked. Cons: I found the OCR/search functions were not as reliable as I had hoped. If every document was properly OCR'd it would have sped up my workflow. I'm still looking for a good data room that solves the problem of individual users being able to tag/sort/group/notate documents in a data room for our personal reference (i.e., setting privileges for who can see the sorting/notes). If this capability is added, DealRoom could further set itself apart. Overall: Overall, DealRoom is one of the best data rooms I've used and would likely use it again. Thanks for the review Jeremy! Appreciate the positive feedback and happy to hear you would recommend us to others. OCR search is something we are considering adding. 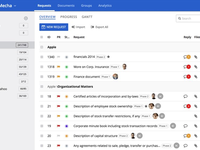 I'm not sure if you were an admin in the room but you can give groups permissions to certain folders to be able to upload/move documents as well as use our requests tab which allows for communication around documents on the platform. Thanks again for the kind words and hope to work with you again! Overall: We use DealRoom extensively in business acquisition transactions. The sellers can easily provide requested materials and save them in a designated spot for ease of use. No need to email files back and forth and get multiple versions of the same data. Thanks for the great review! Glad to hear it's been a value add to your enterprise. 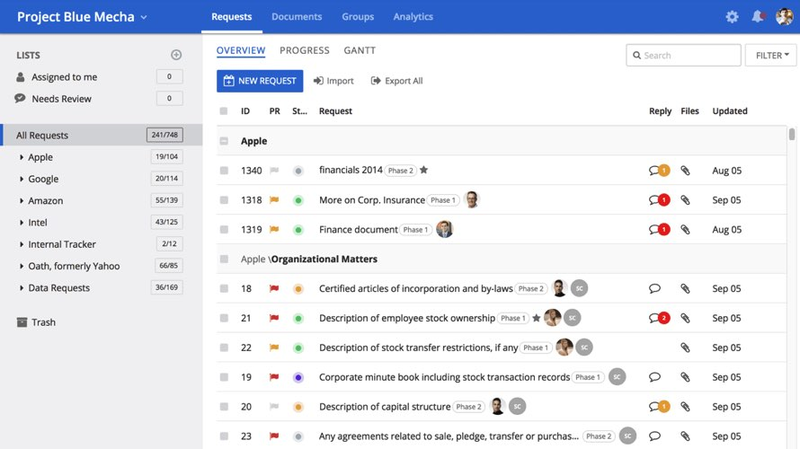 Our main goal is to have a usable tool to make M&A as efficient as possible. Appreciate you taking time to leave feedback and we appreciate your firm choosing to work with us! Simple and intuitive, DealRoom's interface made sharing and facilitating a breeze. Pros: We loved the ability to loop in constituents from a variety of places to see only what they needed to see, as well as the granular level of visibility and control that made monitoring and compliance as pain-free as possible. Cons: There were a few features that would have been great out of the box that weren't available, but our account team was happy to help us develop user-side solutions to accommodate nearly everything we wanted to do. Cons: The alerts received when documents are uploaded by the client could be made easier to sift through. Currently, you'll have to carefully look through the email alert whereas other DR providers alerts really throw the newly uploaded docs into your face. Anything to free up bandwidth. Overall: Overall, DealRoom has been great but maintains room for improvement. Thanks Bruce! Glad the platform has been easy to use and you've gotten quick response time. Appreciate the feedback on notifications, that helps our team continue to improve user experience. Thanks again! Easy experience for end user! 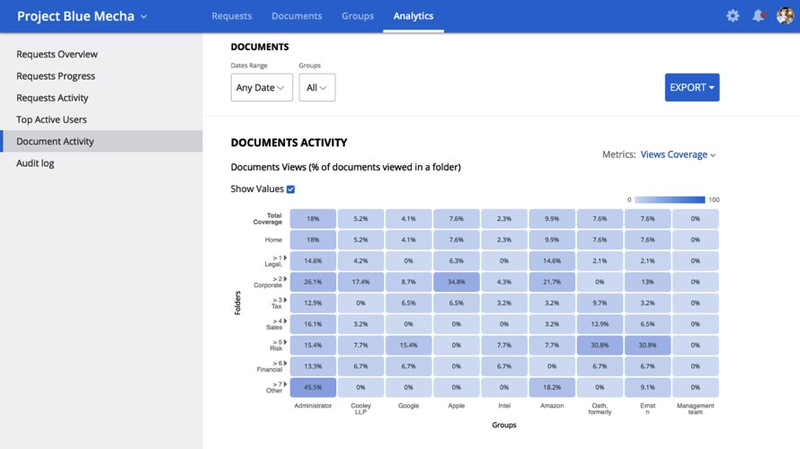 Pros: Intuitive, just like managing folders and documents on my computer. Never had a proble gaining access. Cons: Notifications for each document uploaded coukd be overkill at times, would orefer a daily rollup or a proactive outreach based on the volume of notifications I was getting to ask if I'd like to turn them off. Thanks for the review Kelli! Glad to hear the platform was intuitive and you had a positive experience. Each user has the ability to dial back their notifications to hourly, daily, none at all under their settings tab. Just something to note if you use us on another project! Thanks again! Pros: I liked the preview function prior to downloading documents. I use a Surface pro and scanning pages was very efficient. Documents did not seem buried; easy to find. Cons: Nothing, I just needed to be connected to view documents. Overall: DealRoom is a great way to access confidential documents in an organized and quick manner. A team activity was very successful due to collaboration. DealRoom housed everything and kept us moving through to completion. Thanks for the review Pam! Happy to hear the room was simple to use and kept everything organized! Appreciate you taking time to give us feedback. Thanks again! Pros: The platform is easy to use and the functionality is extremely practical which makes it both enjoyable and sensible when communicating across different positions in our office, streamlining projects and making us all more efficient. Cons: It's an extra step that not all of our employees go the extra mile to use. Overall: We've been able to assure effective communications across the office. Pros: You are email notified of all changes/adds to dealroom. Cons: Spreadsheets can be a challenge to see all cells- you will have to download to get a full file view. This can add a little time - when you just want to see a quick response. 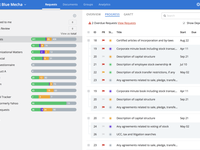 Overall: A good tool to share, review and track action items (along with the current status of action item). The software is easy to use and functions as advertised. Thanks for the review Gregory! Happy to hear you had a good experience and were able to track and update the status of action items. Our goal is to provide a tool to improve efficiency. Appreciate the feedback! Pros: Easy to use and navigate through as well as real time notifications when new documents were submitted. Cons: Unable to use the request for information function but that may have been the way my company set it up. Overall: Excellent platform/tool with easy navigation and use. I would highly recommend. Thanks for the feedback Nora and high recommendation! Glad to hear everything went well. Requests are definitely a huge advantage with using DealRoom, hopefully we can work with you on another project and have that functionality be used! Thanks again for the positive review, we appreciate it! Pros: From a buyer's perspective, the platform has been really easy to navigate, use, and download files. The one time I did have a download issue, the customer support team was responsive and quickly resolved the issue. Thanks for the review Logan! Great to hear you had a good experience from a buyers perspective and happy to hear our customer support team was quick to help you :) Thanks again and appreciate the feedback! 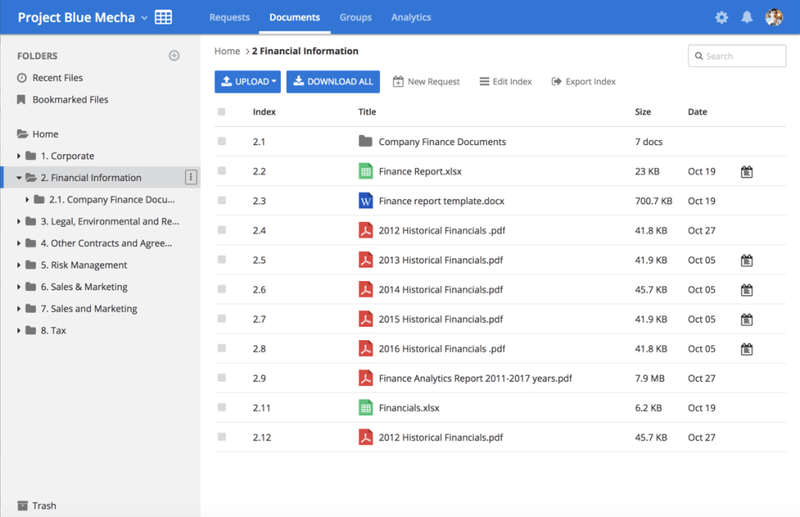 Pros: The bulk download capabilities, the organization by data room when you are in multiple, and the ability to view documents without downloading them. Cons: There is no feature to sort all documents by upload date so that you can see what is new since you last logged in. Some other data rooms have a feature where you can sort new documents by your last login date or by new documents since a particular date you choose. Overall: It achieves it's basic purpose but there are other data rooms with enhancements that provide a better experience. Hello! Glad to hear you are happy with the bulk download capabilities. In the top right above the Home folder you can click Recent Files to show what has been last uploaded and sort by date. Thanks so much for the feedback and hope you use us again soon! Overall: We chose to update to DealCloud because our old CRM was unable to keep up with the dealflow we were seeing. The DealCloud engine made day-to-day processes much more productive and gave us more time for more important parts of the deal process. Hi Quinn! I think you may have meant to leave a review for DealCloud instead of DealRoom. Thanks! Thanks for the feedback John! To rearrange the structure in the room we added an Edit Index button that lets you drag and drop to reorder. If you have any questions feel free to get in touch and hope to work with you on a project again soon! Pros: The ease of use and ability to incorporate it seamlessly to the pre-existing working model. Cons: So far so good, nothing negative to report. Overall: Our org. chart presents a challenge due to the various global locations, where we exist. This tool allows us to work cohesively, never missing a beat. Thanks for the review Hector! Happy to hear it was a seamless transition to using DealRoom from your pre-existing model. Glad the platform allows collaboration across your locations. Appreciate you taking time to give us feedback, it's very helpful! I enjoy using dealroom software. It is easy to navigate. Pros: The ability to quickly see what has been uploaded to the data room in the previous 24 hours. This is extremely helpful. Cons: Instead of a notification email just saying there are new documents and then listing them out, it could say that "5 documents have been added to the finance folder" which would provide a quicker understanding of whether they are material to my workstream. Overall: The ability to quickly navigate through new files in a short amount of time greatly increases efficiency. Pros: The ability to request information through the platform, the download process was easy. Cons: While intrigued by the ability to request information, I didn't use it, because I generally err towards direct email asks. If this was an internal project, I could see the use for the information request features. Overall: I was given access as part of a due diligence data room. The file structure was easy to understand, and downloading was simple. There were a number of features that were beyond my typical data room experience, but I believe could be useful. Thanks for your feedback on using requests! If it was ever something you were looking to use in an upcoming project feel free to get in touch and happy to talk about best use cases. Thanks again! Pros: User face was genuinely easy to use, support was very responsive and helpful. Helpdesk took ownership in the problem. Cons: When you click through an email update to see the new files uploaded, was difficult to go back to the main dataroom site. Thanks Adam! Glad our support was helpful and you've had a good experience with the interface. I've let our team know about the email updates with links to files and see what we can do to make that more seamless. Appreciate the feedback, thanks again! Pros: Easy to understand and use. No issues logging in. The features are intuitive so no real learning curve. Have not experienced any crashes or similar service interruption. Cons: Can not think of any real cons to the software. Overall: Great product for performing diligence with respect to potential company acquisitions. Thanks David! Happy to hear the room has been easy to use right away and you've had consistent service. Appreciate you taking time to give feedback, thanks again! Good introduction and overall review of the software when first introduced. Pros: Organization of data and accessibility of needed information in a centralized location for the team to access. Cons: Syncing to desktop would allow faster and offline accessibility. It is somewhat pricy for a small firm and wish it were more affordable as I know other smaller organizations that would like to use it. Overall: Access to important data it would otherwise take a lot of time to research. Pros: The dataroom was generally easy for me to use. Cons: No specific negative comments on the dataroom. Overall: Was fine - nothing stood out as great or bad for this. Preference for VDRs is to have daily notifications, bulk download, and ability to check for files posted based o date range. Thanks Simon! Great to hear the room was easy to use and there was nothing negative to report. We appreciate the feedback and feel free to get in touch with our team if you have any questions! Appreciate the feedback Thomas! Happy to bring up any typical issues with data rooms to our team and see if there's ways we can improve it on our platform.But glad you've had a good expereince over all, thanks again! Pros: Great ease of access, great presentation. Cons: Not enough notifications for when you receive answers to Q&A. Thanks for the feedback Guy! Happy to hear you found the interface easy to interact with. Thanks for bringing up the response notifications. Tagging yourself as a follower to requests will give you immediate notifications following what you have set as your settings notifications. Thanks again and let us know if you have thoughts on anything else! Pros: Easy to use. Very user friendly so I find ways to use it. Cons: Clients sometimes go into junk. It can be very helpful though. Thank you for the review! Appreciate the high marks and strong recommendation. Glad to hear the interface was user friendly! Thanks for the review Lonnie! Glad to hear the room is easy to use. If you have more feedback on how we can improve set up feel free to get in touch with us at support@dealroom.net. Thanks again and glad the platform is working well with your clients! Pros: Ease of use. It was very easy to download files in a quick and efficient manner. If a file was not downloadable, it was clearly indicated. I liked the ability to download certain folders or the entire database depending on preference. Would definitely recommend. Cons: My only concern was if I posed a question to the DealRoom team or sell-side bankers, we had to create a 'topic', then ask the question, and then assign the question to a specific user. This was not very clear and left a few questions go unanswered for days because no one was properly assigned. Thanks for the review Zach! Happy to hear DealRoom was easy to use and you would recommend it to others. Using Requests to ask a question is best when the Admins of the room have a set process to answer them. Appreciate the feedback and thanks again! Easy to use and setup was very well organized. Pros: The file labeling and folders labeling. The navigation is simple. Files don't take long to load. Cons: It doesn't have the ability to sync to my desktop. Often time teams like to download to desktop and to be able to access the files quickly. Add syncing capabilities. Pros: The security and ease of use is very helpful. We are able to get potential buyers all of the relevant documents in a concise manner and to track who is reading what documents. Cons: Being used to other virtual data room databases, it takes a bit of time to get up the learning curve on the nuances of DealRoom versus others. Overall: Virtual data room to track buyers and provide them access to sensitive company documents for their due diligence. Pros: It has a better selection to review documents. Cons: The format of the software is confusing and does not clearly indicate my most important items (how to download an index, etc.). Thanks for the review John! The help tab would be a good reference on how to download an index and other questions you have. Otherwise always feel free to chat our support team through the site! Thanks for the feedback! Cons: I dont have any complaints. It was easy and customer eccentric. I have sued other similar sites but they were not as good. Pros: It is very easy to understand. For what I use it for it has been easy to keep up with everything I need. Cons: No real complaints about it. Our use is document review and it's been great. Thanks for taking time to write a review Tim! Glad to hear you've had a good experience so far, feel free to get in touch if there's anything else we can help with. Thanks again! Pros: I have been using the product to upload data files. The system is very intuitive to use. Files upload directly from our directory with no problems. Cons: After files upload, they just drop out of the folder where I park them. It could be helpful to know when my files get transferred to some other storage space in your system. Just in case someone here asks about when I uploaded a file. Overall: Using your system to support a deal. For what I am doing (uploading data files), it works great! Thanks for the feedback Joseph and glad the platform has been easy to upload to and intuitive for you. It might be helpful to use the Recent Files filter on the documents tab or happy to discuss more if you would like to contact us directly! Thanks again for the review! Cons: changing and updating status could use some tweaking. Overall: Overall the program is quite beneficial. Thanks John! Glad uploading documents was easy and you found the platform beneficial. We are always looking on ways to improve the functionality so your feedback is very helpful. Thanks again! Thanks Hunter! Glad you found the project management capability helpful and great to hear it's your go to. Always feel free to get in touch with our team if you need anything and appreciate the feedback! 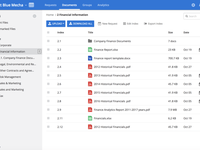 Pros: Extremely easy to upload and organize files, delegate grants of authority and monitor access. Cons: I did not have any negative experiences. Overall: For due diligence data colection, DealRoom is an excellent platform. Thanks for the review David! Glad to hear you had a positive experience with the platform! Appreciate the great feedback! Pros: Very easy to use - our data vault was up and running quickly. The counterparties find it easy to use, too. And the pricing is reasonable. Cons: Need more FAQs or directions for use so that we don't need to contact customer support so much during the set-up. It is just a matter of needing a roadmap to using some of the features. Overall: Very satisfied with how quickly we were able to set up a data room for our transactions. It has the functionality we need for the M&A deals that we do. Thanks for the review Warren! Glad to hear you and your counterparties have had a good experience. More FAQ's and training guides/videos is something we are working on for 2019, appreciate that feedback. Thanks again for the nice comments!